Glock 30. This is a compact, high-firepower, reliable pistol that is just a bit blocky for easy concealed carry in a holster beneath clothing. I think it would be at its best stuffed into one of those belt holsters that looks like a small camera case. Few would believe that you could pack a 10-shot .45 in there. It would be great in a fanny pack, too. Thus put up, it could be worn in plain view with no one the wiser. 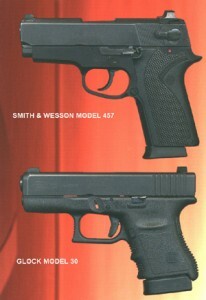 Pre-ban Glock 21 hi-cap magazines can be used for reserve ammo. H&K USP Compact. An excellent and reliable design that could be quick into action in any mode you want. It is concealable, but not nearly so much as the Smith & Wesson or Springfield offerings. I think it would be a good “executive planner” gun that would be unobtrusive in such camouflage and yet quick to deploy. It’s marginally suitable for belt carry under clothing – if carried in this mode, use the flat base plate magazine. 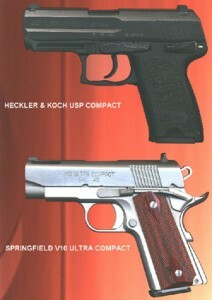 Springfield V10 Ultra Compact. A nearly ideal concealment pistol that’s quick to get into action. Be sure you’re comfortable with the cocked-and-locked carry mode, though. If you love the 1911 design, this one is a great choice. Best for daylight carry, its compensator could mess up your night vision with its muzzle flash. Fast and accurate repeat shots are ridiculously easy with this baby. Use +P ammo with lighter bullets, because you’re losing some velocity with the short barrel and the 10 ports. Smith & Wesson 457. Excellent in the under-clothing concealment role. The thin grip makes it the best of the lot for holstered, under-clothing concealment. Not an especially accurate piece or easy to shoot well for quick precision initial and repeat shots, its best mission is for up close and personal. Good, reliable bang for the buck. And there you have it. Good shooting!